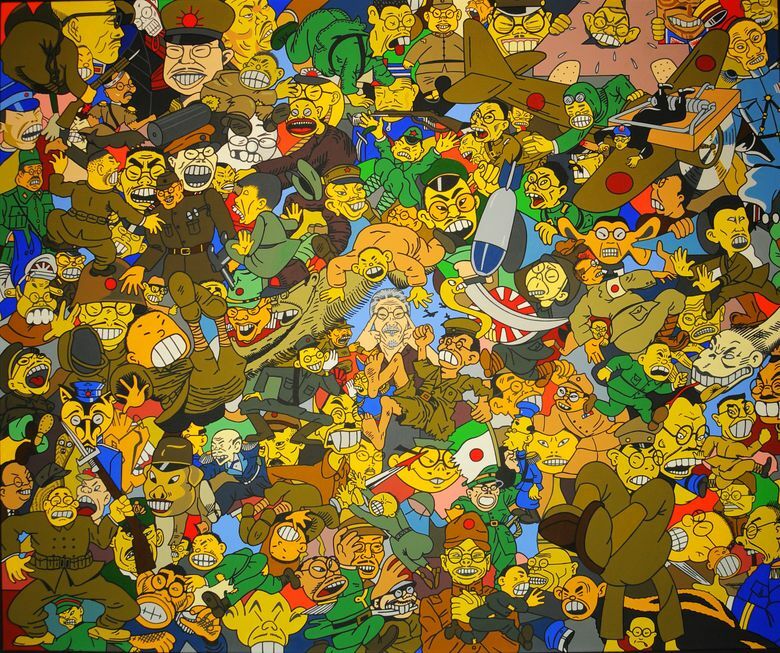 A review of “Roger Shimomura: An American Knockoff” at Tacoma Art Museum through Sept. 13. More than half the paintings in the kinetic and colorful Roger Shimomura exhibition at the Tacoma Art Museum are self-portraits, but that doesn’t necessarily mean we come away from the show knowing exactly whom we’ve been looking at. Shimomura uses his own face as a way of raising questions about the whole issue of identity, rather than portraying a particular self, and we see him taking on almost as many roles and masks as there are individual paintings. In one painting, he poses as a martial artist going hand to hand with Bruce Lee; in another he wears a white wig and leads a group of samurai warriors in a sendup of “Washington Crossing the Delaware,” while in a different picture nearby he peels back a kimono to reveal a Superman costume. All of the works in “Roger Shimomura: An American Knockoff” are painted in an appealing and snappy style that borrows equally from comic art and animation (Mickey Mouse, Popeye), Pop Art, traditional Japanese prints and even Chinese propaganda posters; bright primary colors, strong outlines and bold shapes. The eye candy surfaces are frequently, and at times poignantly, at odds with the deadly serious content. 10 a.m.-5 p.m. Wednesdays-Sundays, until 8 p.m. third Thursdays, through Sept. 13, 1701 Pacific Ave., Tacoma; $12-$14 (253-272-4258 or tacomaartmuseum.org). Take the strongest work in the show, the large Japanese-American internment camp painting entitled “American Infamy #5” (2010, acrylic on canvas), based on the artist’s childhood experience as a camp inmate in Puyallup then at Minidoka, in Idaho, during World War II. On first glance, the large, posterlike landscape panorama has an attractive, heroic quality, with a group of stalwart-looking GI Joes dominating the foreground, taking their guard tower work seriously by training their machine guns on the crowd below. The camp barracks are reduced to grim black boxes in perspective, surmounted by cutout black clouds, set against a stark desert landscape. Only when we examine the painting in more detail does the artist’s outrage come into clearer focus. The crowds of people the soldiers are guarding are a cross-section of ordinary society: elders in wheelchairs, children on scooters or jumping rope, even Japanese-American servicemen visiting relatives in detention. The real heroes of the painting aren’t the guards, but the inmates. Gary Faigin is an artist, author, critic and co-founder/artistic director of the Gage Academy of Art.